45 years ago, when Hilleberg was established, we were not yet known for our tents, but both the company and our founder, Bo Hilleberg, were actively involved in the forestry industry. So our passion for nature and for the outdoors was already an integral part of the company when, a few years after the founding, the first prototype of what would later become the completely revolutionary Hilleberg tent was designed and built. Even though much of our focus has been on being in the mountains, forests have always been a big part of our company. So we are very excited about our partnership with Vi-Skogen (skogen means agroforestry Swedish), which we support by donating one tree for every tent we sell. For more than 25 years, Vi-Skogen has been contributing to improving the living conditions of over a million impoverished people living in the Lake Victoria Basin in western Africa. By planting trees and encouraging agroforestry – the planting of trees and crops together – as well as through education, Vi-Skogen helps small farmers combat poverty, environmental destruction and climate change. Each tree planted helps control erosion, pulls CO2 from the air, reduces evaporation and water use, and gives shade, shelter and protection for other crops. Both the education and the tree planting helps improve living standards, fosters greater equality, and improves the environment, both locally and globally. Vi-Skogen is a part of the UN’s Billion Tree Campaign. Vi-Skogen is a Non-Governmental Organization (NGO) headquartered in Stockholm that runs six agroforestry projects around Lake Victoria: two in Kenya, one in Uganda, two in Tanzania and one in Rwanda. Vi-Skogen currently works with about 150,000 families – over 1 million people – and is actively looking to assist many more. Roughly 30 to 40 million people live in the Lake Victoria basin. Vi-Skogen’s agroforestry projects are registered as NGO’s in their respective countries. Over 30,000 private donors financially support the Vi-Skogen’s programs annually. Vi-Skogen also gets annual allotments from Sida (Swedish International Development Cooperation Agency), and the Swedish Cooperative movement. Vi-Skogen has no political or religious affiliations. Projects are organized into Areas of Concentrations (AOC), consisting of 300 to 350 farm households. This deliberately chosen compact size means that a single development worker can comfortably work and interact with all the households in an AOC. More importantly, each development worker lives within his or her AOC. Between 15 and 20 AOCs are organized into a zone, and each zone is managed by a Zone Manager who is responsible for coordination and follow-up. Today each project has between 100 and 150 AOC’s in 7 to 8 zones incorporating between 30,000 and 50,000 farmers. In explanation of his – and Hilleberg’s – outdoor “philosophy,” Bo Hilleberg once wrote, “I do know that an outdoor life’s simplicity is what is most compelling: while it is – and always has been – a revelation to me to arrive at a beautiful place and camp, it has always been at least as important to leave that spot the next day looking as though I’d never been there.” This belief has been an essential part of our company from the beginning, and it explains exactly why we have long been a corporate partner with Leave No Trace. Leave No Trace was originally created by the US Forest Service in the 1960’s and then incorporated into its own nonprofit organization, the Leave No Trace Center for Outdoor Ethics, in 1994. Leave No Trace’s philosophy is simple: leave the places you enjoy in as good or better condition than you found them. Their mission is to educate people how to achieve this through minimum impact training, educational tools and related information, and they work with everyone from individuals to government land management agencies. They are guided by the idea that outdoor resource conservation is possible when all who enjoy the outdoors know how to respect and prevent impacts from their activities, and that it is every person’s responsibility to protect the natural heritage for the future. Their ethical philosophy – and their mission –is spreading worldwide, and Leave No Trace partners with organizations in dozens of countries, reaching both millions of Americans and many more in other countries. Hilleberg first became involved with Walking with the Wounded (WWTW) in 2013, when the foundation organized the South Pole Allied Challenge. Originally created as a race, the Challenge involved three teams of wounded veterans who were slated to compete in a 320 km/200 mile charge to the South Pole. After months of preparations and training, the teams left for Antarctica in December 2013. Upon arrival, the unexpectedly harsh conditions caused the event to be altered from a race to a straight out trek to the Pole. The three teams banded together and made the trek together. The South Pole Allied Challenge was the largest ever ski expedition to the South Pole. 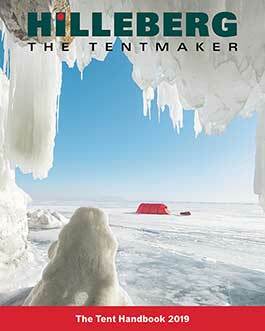 Hilleberg was honored to have supplied the tents the veterans used during their expedition. Walking with the Wounded is a UK-based foundation created in 2010 to raise money for re-educating and re-training wounded servicemen and women. WWTW helps fund training and education to help these veterans find a career, so that they can support themselves and rebuild a life in the civilian work place. WWTW also promotes awareness about the community of wounded veterans and the challenges that they face by putting together high profile expeditions, generously funded by corporate donors, with both wounded veterans and current soldiers.